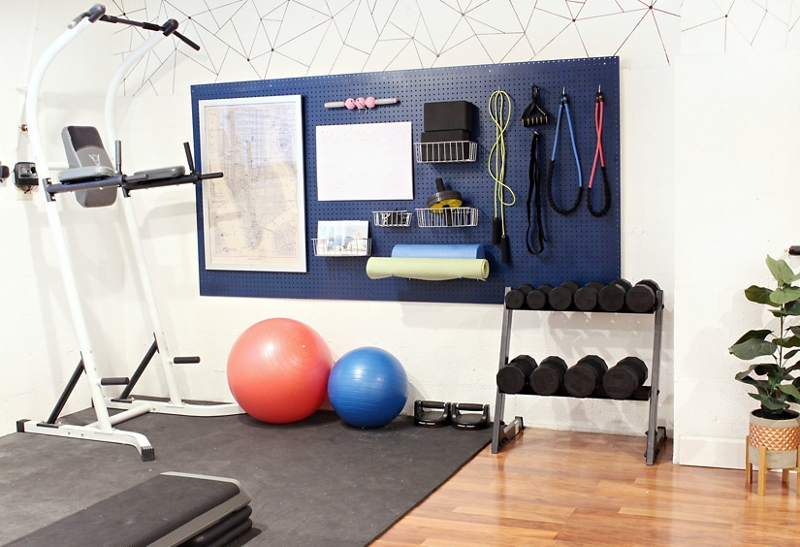 Create a home gym organization pegboard with Krylon® satin and metallic hues to help with workout motivation! Place the pegboard on the covered surface and spray paint using 3 coats of Krylon® ColorMaster® Paint + Primer - 25% More in Satin Oxford Blue. While the pegboard is drying, use 2 coats of Krylon® General Purpose Metallic in Silver Metallic to paint the baskets and other accessories. Allow the pegboard and accessories to fully dry. In the meantime, mount the 8’ x 1” x 2” boards to the wall in your home gym to create a frame to mount the peg board on. This allows for space between the wall and the pegboard, which makes it easy to put hooks into the pegboard holes. Attach the pegboard to the frame with wood screws. Once everything is dry and you have mounted the frame and pegboard, hang all of the hooks and baskets on the pegboard and organize all of your extra gym equipment, such as jump ropes, resistance bands, weight lifting gloves, DVDs, and yoga mats.